Ching Ming festival is a traditional Chinese festival, is also the most important sacrifice holiday, is the day of worship their ancestors and the grave. The grave commonly known as ShangFen,the sacrifices of the dead an activity. The han nationality and some minority are mostly in the ching Ming festival the grave. According to the old tradition, the grave, people to carry goods such as especially fruit, paper money to the cemetery ,will be food for offering in the tomb of loved ones, then the dead incineration, grave earthed up new soil, fold a few branches of the 60-footgreen inserted in a grave, and then KouTou worship salute, finally eat especially home. The poets in tang dynasty DuMu poem 'painting' :'time. though rain in succession, pedestrian rains fall heavily as qingming comes JieWen restaurant where you have. The most ambitious almond flowers? Village.' Write the tomb-sweeping day special atmosphere. 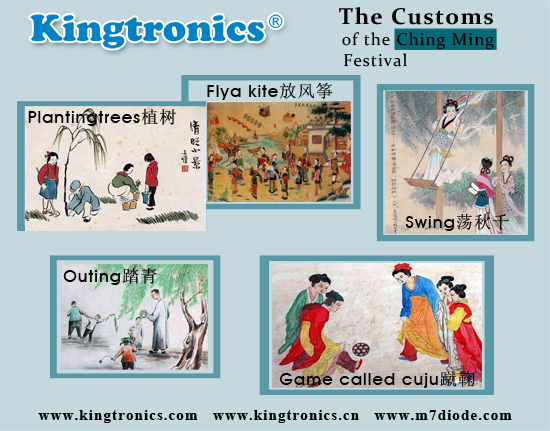 This is our country ancient qing ming festival customs. Swing, meaning clench leather string and migration. Its history is very old, and the first call century, in order to avoid after taboo, to swing. Swing of the old tree YaZhi multi-purpose for frame, then switch to make the ribbons. Then gradually developed for use two rope and pedal swing. Play not only improves the health swing, and can cultivate the brave spirit, unit now is people, especially children's favorite. A ball is bowed, ball with leather skin made, the ball inside with wool plugged. A game called cuju, which is with enough to play football. This is ancient tomb-sweeping day's favorite when a game. Legend has it that the invention of the yellow emperor, original purpose is used to train warrior. That old TanChun, XunChun, etc. During march, spring warms the earth, nature become a vibrant picture everywhere, it is the good old days for an outing. Our country folk to keep for a long time the habit of clear outing. There are some called the qingming festival 'Arbor Day'. Planting trees customs has been spread until now. In 1979, the National People's Congress standing committee regulations, 12 March each year for our country Arbor Day. The mobilization of the people of all ethnic groups inmotherland green actively carry out activities, has the extremely vital significance. 【Flya kite——放风筝】 Qing ming day is enjoyed by people of activities. Every qing ming day, people not only BaiTianFang, also put on at night. The night wind or stability in kite hung astring of arrows color small lanterns, like the shining stars, called 'the absolute being light'. In the past, some people put a kite the blue sky, then cut matchmaking, let the wind put them sent to the ends of the world, itis said that this can except disease disaster, bring you good luck.